How to solve the firewall change management challenge? "How to solve the firewall change management challenge?" How to overcome the challenges of firewall changes? Firewall changes are a constant, but as business grows—changes must be made to the firewall to accommodate the new requirements. These changes present a number of challenges to firewall administrators and can present serious risk to the business. Changes in general, whether to a firewall, router, application or any other part of the IT infrastructure, are the single greatest cause of outages. If change is not effectively managed, it presents a serious risk to business continuity. Don’t you want to secure your business processes? 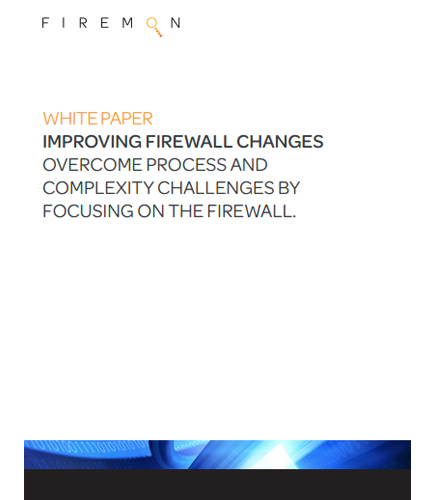 Read this whitepaper which explains in detail the processes to manage this complexity, technology needed to automatically track firewall configuration changes, and describes the process of change management. Download this whitepaper that assists organizations to improve the firewall changes by addressing the few general questions. How to improve the firewall challenges? How to track the firewall configuration changes? How to address the unique challenges of firewall changes facing enterprises today?